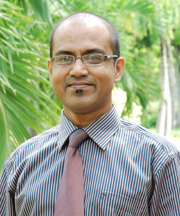 Dr.Zakir joined AIT Extension in February 2010 as a Senior Program Specialist. His main duties are to respond to training requests, formulate training proposals, plan, design, develop and deliver courses. His responsibilities include identifying and anticipating short-course training and continuing professional education demands and needs in agriculture, resources and environment arena. Before joining AIT Extension, for several assignments, he was attached with Walai Rukhavej Botanical Research Institute (WRBRI) at Mahasarakham University, Thailand; University of Southern Denmark; National Environmental Research Institute (NERI), Denmark; Asian Disaster Preparedness Center (ADPC), Thailand; Oxfam GB Thailand Program and other two units of Asian Institute of Technology (AIT). As a Quality Assurance Manager and Fisheries Microbiologist he had started his professional career at the age of 23. While serving for the largest seafood exporting firm in Bangladesh, his main duty was to implement and ensure quality standards in seafood and fish products processing and export. As a trained microbiologist, he was responsible for establishing Microbiological Laboratory and implementing HACCP (Hazard Analysis and Critical Control Point) concept in overall process line (i.e., farm to shipment/table). While attached with AIT, Dr.Zakir has coordinated several international research projects, international conferences and technical workshops, and international training courses on Sustainable Aquaculture Development, Live Fish Marketing, Sustainable Coastal Resources Utilization, Freshwater Prawn Farming, Mangrove Management and Nypa Palm Utilization, Integrated Coastal Management, Application of Geoinfomation Technologies in Coastal Zone Planning and Management, HealthGIS, Geonformation Technologies in Disaster Management etc. He has received both his Masters (M.Sc. in 2001) and Doctorate (Ph.D. in 2009) Degrees from Asian Institute of Technology (AIT). His area of specialization is Integrated Coastal Management and Coastal Conservation Planning. He was a Duo-Denmark Fellow at University of Southern Denmark (Syddansk Universitet), where he had finished part of his doctoral study. Prior to joining AIT, he obtained his Bachelor Degree (B.Sc. Fisheries in 1997) from the Fisheries and Marine Resources Technology Discipline, Khulna University, Bangladesh.